Being part of a group, a gang, a family; it’s in our DNA. We’re social creatures and there’s no way of getting around wanting to belong to a group outside of our immediate families. It could be a mother and toddler group, or a local OAP bridge players group, but it also applies to the workplace. Dave Logan and Halee Fischer-Wright, authors of Tribal Leadership: Leveraging Natural Groups to Build a Thriving Organization, say that your tribe is more important than anything else at work, that workgroups are more tribal than departmental, and that tribes are ultimately more powerful than companies or executives. There will always be smaller groups formed within departments and a leader will generally emerge from each group. The leaders within these personal groups will have more sway than the ‘boss’. In this sense, how you interact with the people you work with will ultimately affect your perception of, and your happiness and sense of fulfilment in your career. It also affects how proactive you are in managing your work/personal life balance. 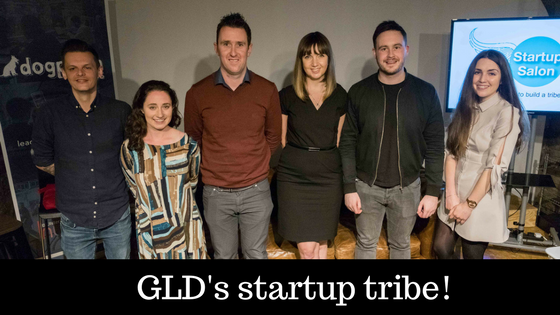 On the 13th of April we had our first Startup Salon of 2017 which focused on the theme of finding your tribe. On the panel we had entrepreneurs from various business backgrounds and sectors speak about how important it was for them to be surrounded by likeminded individuals, their tribe, to support them as they grew their ideas and eventually turned them into a business. One thing we heard from all of our panellists at this event was that you’re at nothing if you don’t enjoy what you do. A big part of being passionate about your work is having great connections with whom you’re working with. For a company to meat their goals, everyone must be on board. The company’s goals must be their goals. Coolest Project’s Noel King mentioned how he would never compromise on hiring staff – everyone he hired had to be a perfect fit. These entrepreneurs aspired to create their tribe from the top down, to surround themselves with people who shared the same enthusiasm for the same vision as they did, and it seems to be paying off. This focus on building connections with those you work with, is a central focus of our monthly Intraprenuers Squad meet-up. Aspiring corporate changemakers – intrapreneurs – looking to lead the kind of changes that need to happen to create a culture that’s ripe for a culture innovation to form, will need to adopt the same approach to building connections as the founders featured in our recent Startup Salon did. Building a tribe will help them and other changemakers to successfully navigate the political system in their organisation and collectively tackle the various blocks that impede innovation. Our next meetup is on Wednesday 24 May, you can register here.